GREEN BAY — Mike McCarthy made it official. “It’s a fast start,” the Packers head coach said of the team’s 4-0 record, the team’s goal heading into the season. “I feel very good about what we’ve accomplished but our focus is on the St. Louis Rams,” he added. If the Packers and their fans might take a moment to savor the first four games of the season, what is most worth celebrating is the play of the defense. “It’s a down and distance football game. The ability to stop the run sets up things. Stopping the run and being able to run the football is our A No. 1 priority,” McCarthy said. One of Sunday’s stars is linebacker Nick Perry, whose two sacks has him off to the best start of his career. 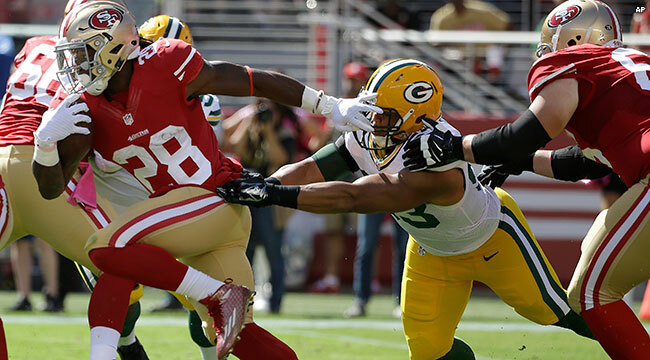 “Nick is playing really good football and I like the rotation we have going with our front group,” McCarthy said. “This is a NFC game. We just need to grow from the first quarter. There’s a ton on the film to learn from,” McCarthy said in launching his team into the second quarter of its schedule, which includes a potential feature attraction game in Denver.